Here is an article I wrote for Mini Rider in 2006 covering the mini classes @ the 2006 Kawasaki Race of Champions (KROC). The motocross world was very different in 1976. Two-stroke machines dominated the racing scene and current champions Ricky Carmichael and James Stewart weren’t even born yet. On the east coast in the State of New Jersey, a new track was only a year old. Old Bridge Township’s Raceway Park started racing on what was once an open field next to their drag strip. The Race of Champions was started as a special year-end event and now thirty years later it is still going strong. Early on the race was sponsored by a local country club but when Kawasaki and their Team Green program came along a couple of years later the race took on its current sponsor. Over the years the Race of Champions has been the site for stellar performances by a multitude of Team Green riders like Billy Liles and Donny Schmidt in the early days and most recently Kyle Chisholm and Ryan Sipes in more recent years. James Stewart and Ryan Villopoto even used the race to make the jump from minis to the full sized classes. Just about every top mini bike rider has at one time raced a Race of Champions event. For 2006 track designer Mickey Kessler put his bulldozer in overdrive and with the help of a great staff got the track in race conditions for the hundreds of riders signed up to compete. Sixty truckloads of sand were brought in to create a rough challenging track. With classes for riders as young as seven all the way up to the 40+ Expert divisions if you race motocross there was a class for you. The first mini moto of the weekend was for the 65cc 7-9 class and KTM rider Darian Robinson grabbed the holeshot and set the pace for the moto. Robinson was on the gas and checked out from the rest of the field on his way to a nearly forty second lead at one point in the moto. But behind him, the racing was tight with Robert Allen, Damon Fiore, Damian Thompson and Trevor Shaffer all doing battle for the podium spots. Robinson took the moto win followed by Fiore and Allen rounding out the top three. Robinson again grabbed the start in the second moto and pulled away from the field going for the moto and overall win. Fiore ended the moto in second and was second overall with Shaffer coming in third for both the moto and overall. 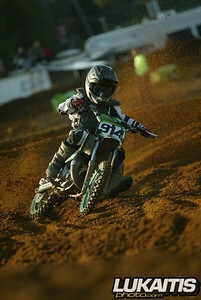 In 65cc 10-11 class racing Team Green rider Zachary Bell put his Kawasaki out front grabbing the first moto holeshot. Chris Canning was in second and Nick Desiderio was in third. Popping into the front section of the track it was still Bell out front but now Desiderio was in second and charging for Bell. When Desiderio’s pressure forced a mistake by Bell and he went down just past the finish line Desiderio took the lead. Bell was back up quickly but now back in third place. Desiderio would go on for the moto win with Bell getting by Canning for second dropping him to third. Desiderio grabbed the start in the second moto and began to run from the field. He hadn’t ridden a 65 in nearly a year but showed no signs of being rusty taking the moto and overall win. Bell was second in the moto and overall as well with Canning again rounding out the podium in third. After two gate malfunctions the 85cc 14-15 class got off the line with Honda rider Ray Leybovich grab the holeshot coming out of the first turn but Andrew Johns kept his Kawasaki driving and made the pass going up the giant “ Staircase” section of the race track. Leybovich was by Johns quickly and tried to make a run for the victory but Yamaha rider James Decotis wasn’t about to let that happen and he was on the gas in the very rough sand section of the back of the track working his way into second. Dropping back into spectator view in the center of the track it was now Decotis out front followed by Leybovich in second and Johns in third. The positions would remain unchanged and that’s how they would finish. The second moto was a copycat of the first moto with Decotis this time grabbing the start and going for the victory followed in second by Leybovich and Johns in third. 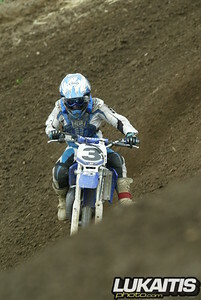 85cc 12-13 class racing got underway with Cody Robbins grabbing the advantage off the start. His lead was not safe as KTM rider James Justice in second and local rider Frank Lettieri in third. These three riders would battle the entire moto with each other seldom more than a couple of bike lengths apart. Robbins would hold on for the victory followed by Justice and Lettieri. The same three riders would challenge for the victory in the second moto with Lettieri grabbing the early lead. Robbins and Justice would eventually get around the Suzuki rider dropping him back to third. Robbins went on for the win, Justice in second and Lettieri in third. Nick Desiderio grabbed the early lead in the 85cc 7-11 class followed by Joey Peters and Tyler McSwain. Desiderio used his home track advantage to stretch out the lead and go on for the victory. Desiderio was literally flying as he was the only 7-11 rider jumping the huge triple-double section in the center of the track. Peters would finish the moto second and McSwain was third. Desiderio was again the early leader and never looked back taking the moto and overall victory Zachary Bell finished second in the moto and Joey Peters rounded out the top three. 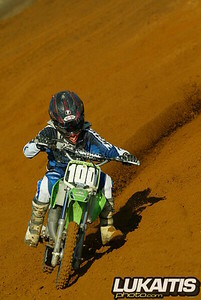 In other mini bike racing, James Justice won the Junior Mini class and Cody Robbins was the top rider in the Supermini class. As part of Sunday’s pro racing schedule, the top 13 in each 85cc class would go on to compete in a special exhibition moto. The Mt Holly/Fox mini cycle shootout was won by Frank Lettieri with Damian Krause being the lucky raffle winner taking home a brand new KX85 courtesy of local dealer Mt Holly Kawasaki. 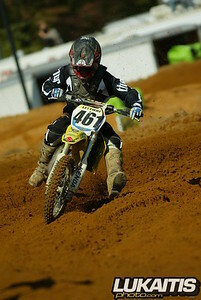 The 65cc class had its own special race for the top twenty 65cc riders from Saturday. The Town and Country/Kessler Cup was won by Zachary Bell after a race long duel with Nick Desiderio. The Bell family was very happy as younger brother Chase was the lucky winner of the new KX65 courtesy of Town and Country Cycle Center. Kawasaki factory riders James Stewart and Timmy Ferry were on hand signing autographs and riding a special exhibition on Sunday afternoon wowing the crowd with their skills. The 30th annual event had excellent racing in all classes. With the history that this race has of discovering new talent, who will be the next James Stewart? Come next year. Maybe it could be you.